The Narrative1 Excel file is N1Appraisal.xls, also known as The Appraisal Engine. This is the heart of the system. File data and valuation analytics are developed using the Narrative1 Appraisal Engine, then merged to the narrative document. Important: Most of the data input is optional! Ignore what does not apply or what you do to wish to use. Use as much or as little of the system as you like. Access the navigation dialog from the man menu (see screen shot below), by keyboard shortcut (ctrl+shift+n), or right-click and select Navigation. Depending on the monitor size and screen resolution, some worksheets tabs (bottom of screen) may be out of view. 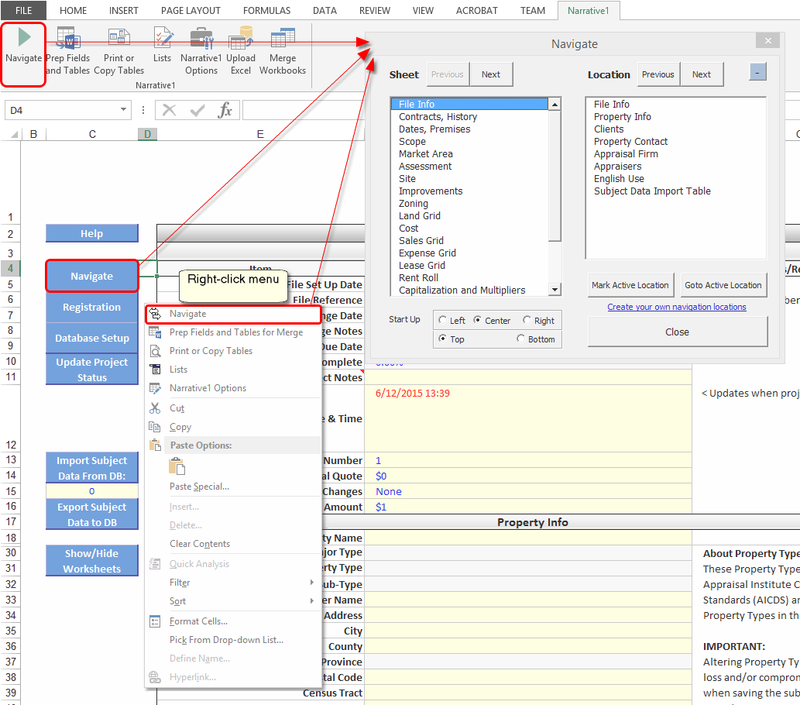 Narrative1 uses color codes to cue the user for input, or indicate calculated results and auto-fill data. Color codes are also used for navigation markers, help links and tips. 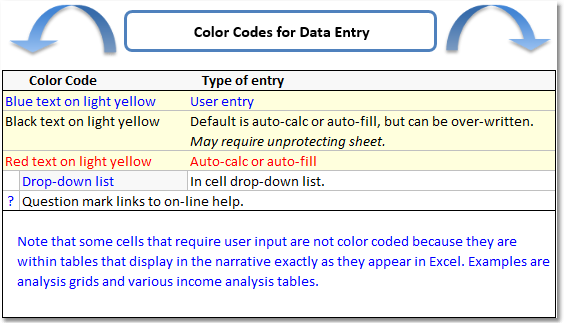 Note that some cells that require user input are not color coded because they are within tables that display in the narrative exactly as they appear in Excel. Examples are analysis grids and various income analysis tables. Tip: Help pages can be printed, but hey, we're all going green, so please think twice before printing.